Homemade meat sauce is baked in the oven for a deep and rich tomato, garlic, and herb flavor. It is the best meat sauce ever and perfect spooned over your favorite pasta and topped with grated parmesan cheese! I think that everyone should have a great homemade spaghetti sauce recipe in their recipe arsenal. It's not as hard as one might think to make, it makes a big big batch, and the results are always amazing. Times doesn't always allow for making homemade, so I do try to keep a few favorite jarred sauces in the pantry, but nothing beats the deep flavors of a nice baked homemade sauce. Yep, I make a baked sauce. That's the way my mom and her mom make it! A family tradition! All you have to do is get a nice big roaster like this one and slow simmer your sauce in the oven until tomatoes caramelize on the sides and the flavor Gods sing. It really is a beautiful thing. 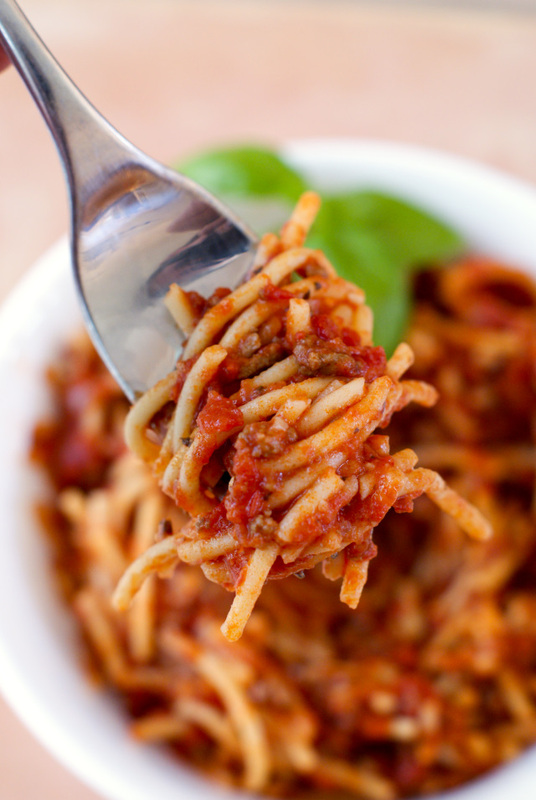 My fave is spaghetti sauce with meatballs and sausage, which is the way my grandmother has always been known to make it, but my husband has always preferred a meat sauce, so I had to come up with a great homemade sauce recipe for him. This is the recipe that I like to use and both the kids and he love it. I freeze the leftovers and there's always more that enough for several meals! You can adjust the seasonings slightly to suit your tastes (see the notes below), but all in all, this is my family's favorite ever homemade meat sauce! I am sure it will be yours, too! Heat the olive oil in a large frying pan over medium-high heat. Add the diced onion to the pan and cook, stirring occasionally, until the onions are translucent. Add the garlic, Italian seasoning, dried basil, dried oregano, and ground beef to the pan. Break up the ground beef with a spatula and cook until no longer pink. Empty the tomatoes into a 15-inch roaster. This is the roaster I use . Pour a small amount of red wine into each can and swirl around to get all of the tomato left in the can. Pour into the roaster. Add the tomato paste, salt, and meat mixture to the tomatoes and mix well. Cover and bake in the preheated oven for 1 hour. Uncover, stir and continue baking uncovered for an additional 30 minutes. Different brands of tomatoes have different tastes. Some are a little sweeter and some are a little saltier. Adjust the salt or even add little bit of sugar to suit your tastes.